On a windy Friday in February, I travelled to the Folger Shakespeare Library with brilliant Penn State Abington students who have been transcribing the Carlyon manuscript all year as part of my “What’s in a recipe?” research project. (PSU wrote a great story about our trip here.) I also asked the wonderful Folger librarians and staff to display a range of recipe books for my students to look at. We were all excited to see Mrs. Carlyon’s book of medicines, but I was particularly excited to meet Mary Baumfylde’s manuscript recipe book in person for the first time. I’d already transcribed a lot of the book, made this bisket recipe, and chosen a few more recipes to test this spring. Despite having carefully read the description of the manuscript, it’s small size surprised me. Seeing things in person is always best. 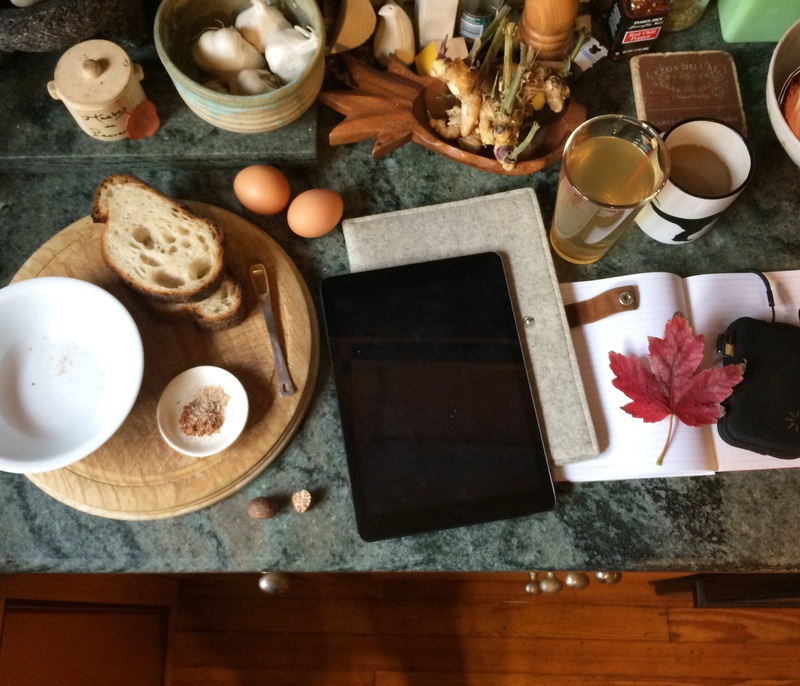 Of course, tasting recipes is always best, too. This time, I decided to try Baumfylde’s recipe for sassages (or sausages). I was intrigued that this recipe provided instructions for both cased and uncased sausages. 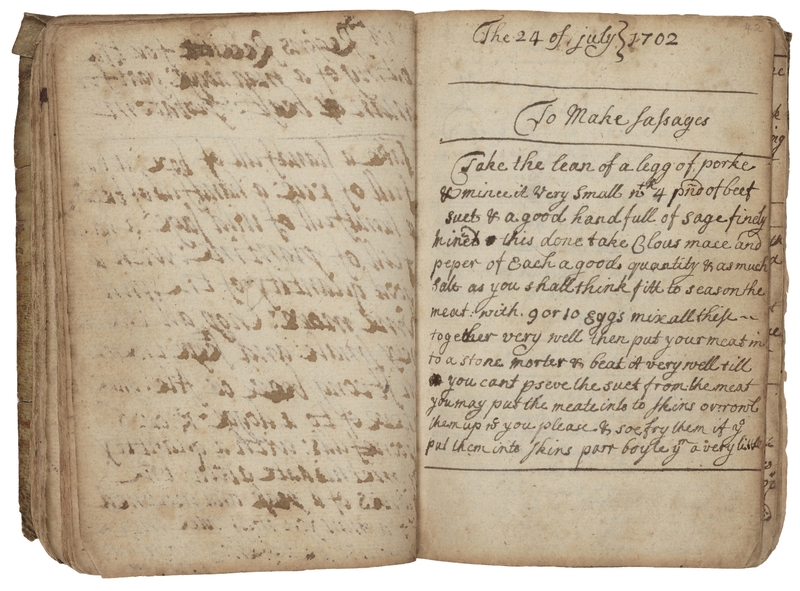 It’s also one of the rare recipes that comes with a specific date: 24 July 1702. Baumfylde’s sassages are delightfully flavored with sage, mace, cloves, and black pepper. The original recipe makes A LOT of sausages. With a whole leg of pork and four pounds of beef suet, it’s a mighty big batch of seasoned meat. Working from the idea that a leg of pork is between 10-14 pounds, I made 1/10 the original recipe and still had loads of sausage mix to eat. I started with a pound of Stryker Farm ground pork and leftover beef suet from making these mince pies. The ground pork likely has a higher fat content than the lean meat called for in the original recipe. If you don’t have beef suet to hand, you can absolutely use bacon or lard in its place and adjust the amount to your taste. Mix all ingredients well in a big bowl. When you’re ready to cook the sausage, heat a cast-iron or heavy frying pan over a high heat. Add sausage patties and cook for at least five minutes until brown on the outside and cooked through. I did not need to add butter or oil for frying because of the fat content of the sausages themselves. Flip or rotate the sausages so that all sides brown evenly. Rest a minute before eating. My British spouse, Joseph, loved these sausages. They reminded him of classic British pork sausages and other dishes like pork pie that are flavored with mace and clove. My parents thought they were delicious, too. But, alas, they weren’t my favorite. I think something about the mace, cloves, and beef fat tricked my tastebuds and made me anticipate sweetness, not savory flavors. That said, they were a big hit. I bet they’d be good encased, too. Later this spring, I’m flying to Los Angeles to participate in a workshop entitled “Transcribing and Interpreting Digital Recipe Manuscripts” at the Shakespeare Association of America annual meeting (SAA). I often attend this conference, but I always go to talk about plays. My research is currently bifurcated between writing a book about plays and cooking historical recipes to post here. SAA is a place where I’ve tried out many of my book ideas in small, collegial seminars. 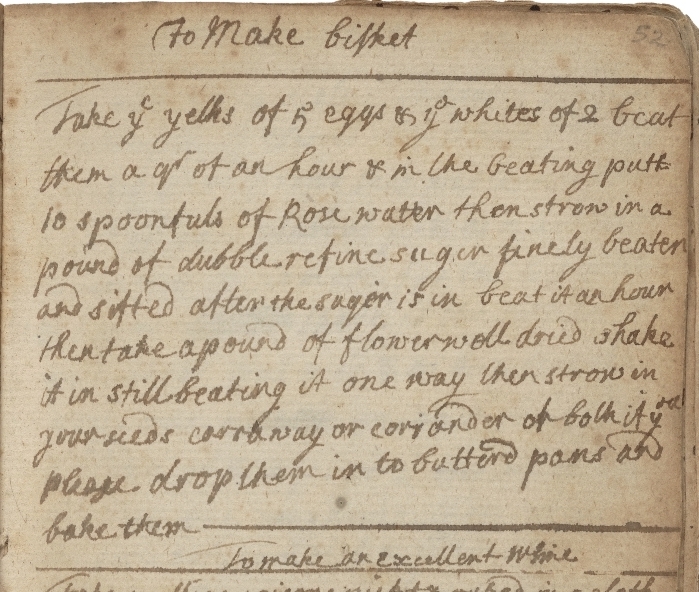 This year, instead of drafting a traditional paper, I’ve been transcribing Mary Baumfylde’s manuscript recipe book, Folger Shakespeare Library V.a.456 alongside other workshop participants. And, in turn, I’ve been reflecting on how I got into this seemingly double practice. Back in the earliest collaborative google doc draft of our first Cooking in the Archives funding proposal, I wrote the sentence “What are recipes if not instructions for cooking?” A play is a script intended for performance, a husbandry manual tells you how to care for animals, a music book is a provocation to song: What is a recipe book if not a repository of possible action? My simple sentence has migrated from word doc to word doc, abstract to conference paper, paper to article. I keep repeating it, because I keep needing to make this point and this sentence keeps working for me. 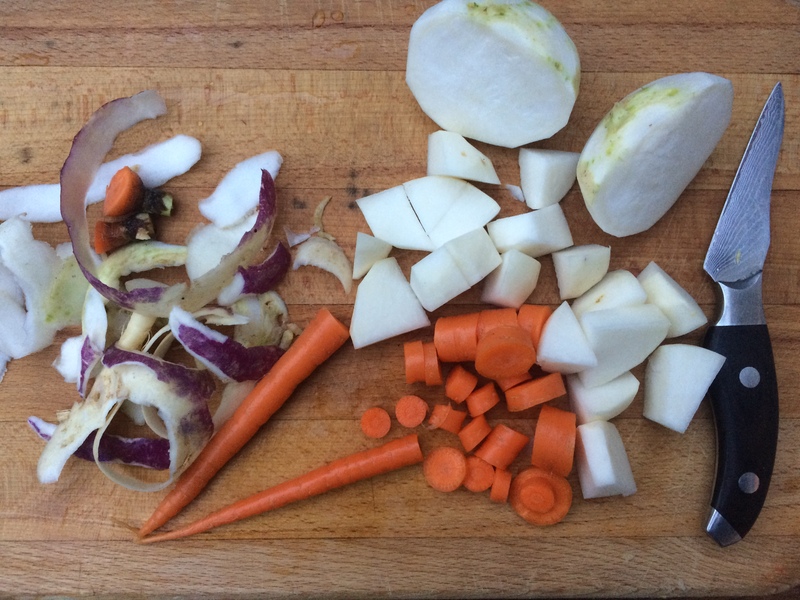 I think of recipes as culinary scripts both in my personal cooking and my recipe writing here. Let’s consider this post a partial recreation of the performance of a recipe “To Make bisket” enacted in December 2017. When I started transcribing Mary Baumfylde’s manuscript recipe book in preparation for the SAA workshop, these biskets intrigued me because they don’t have any butter in them. 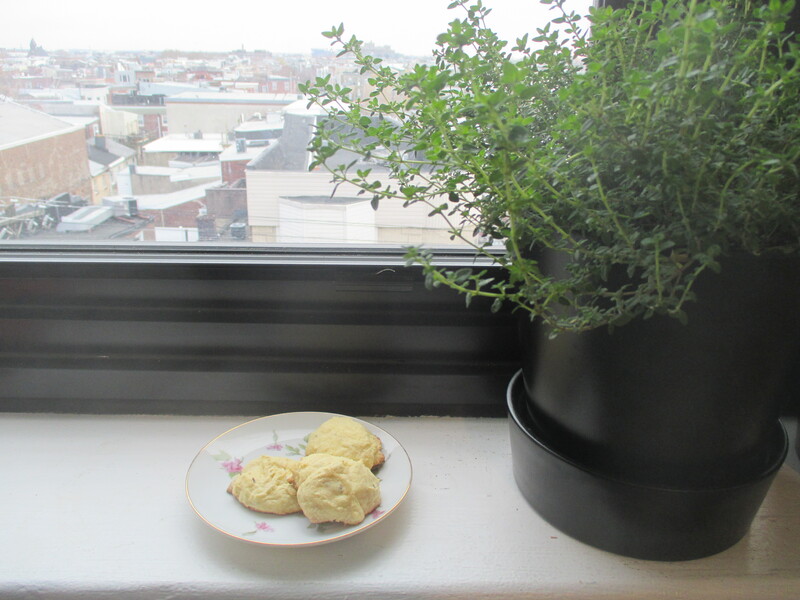 Dense, chewy, and nicely spiced, these biscuits were a great addition to an afternoon of Ramboose-fueled festivity. Whitney, Sarah, Phil, and Joseph liked these biscuits more than the accompanying drink. Stay tuned for more recipes from Baumfylde’s manuscript. I’ll be cooking from this book for the coming months. 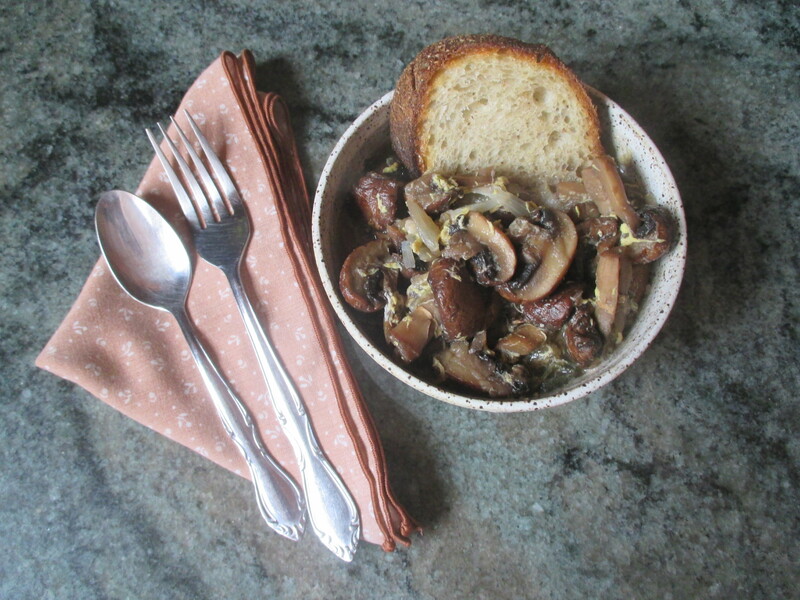 I’m excited about the recipes for stewed mushrooms and cabbage pudding on this page, and pickled walnuts on this page. Halved from the original, this recipe still made quite a few cookies. Preheat your oven for 375F. In a large bowl, beat eggs with rosewater. Add the sugar and beat until well combined. Stir in the flour and seeds. 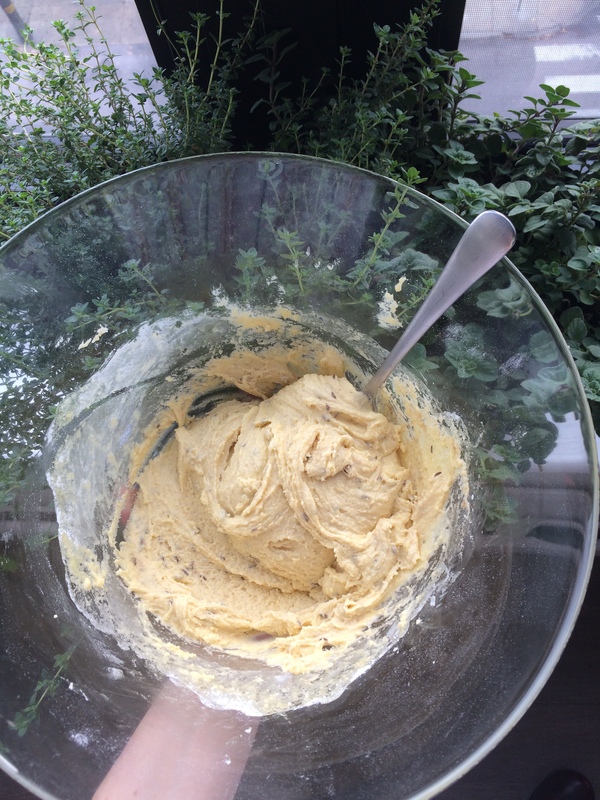 Dollop the batter onto a buttered baking sheet to make small cookies. Bake for 10 minutes, until golden brown. 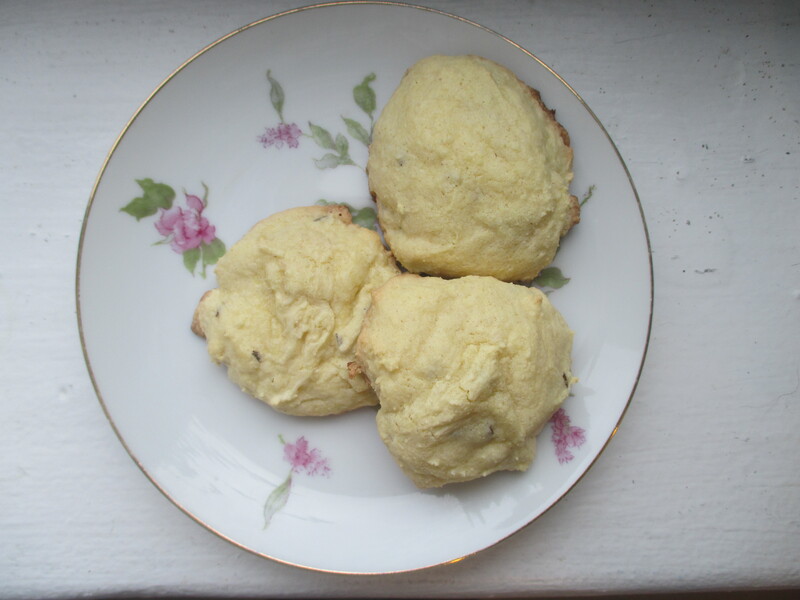 Simple and flavorful, these biscuits are easy to make. They are distinctly chewy and rich from eggs, but not butter. We experimented with larger biscuits and a lower baking temperature, but smaller biscuits and a hotter oven worked better. It was a good first performance. Back in October I was skimming Twitter and saw the word “Rambooze” for the first time in my life in this tweet from the Shakespeare’s World transcription project. Listed among other drinks in Folger Shakespeare Library MS V.b.363, a late seventeenth-century receipt book, this eggy punch immediately caught my attention. What in the world was Rambooze? With a name like this, I had to give Rambooze a try. Luckily, Whitney, Sarah, Phil, and Joseph were curious to try it, too. Beat together wine and egg yolks. Strain through cheesecloth (or a paper coffee filter). Put some ice in a cocktail shaker. Add a cup of the eggy-wine, 1 egg white, 1/4 t sugar, a pinch of the fresh ginger. Shake vigorously and a lovely froth will form. Pour into a fancy glass. (Optional: Add 2-3 oz ale.) Garnish with grated nutmeg. The resulting beverage was interesting, but strange. 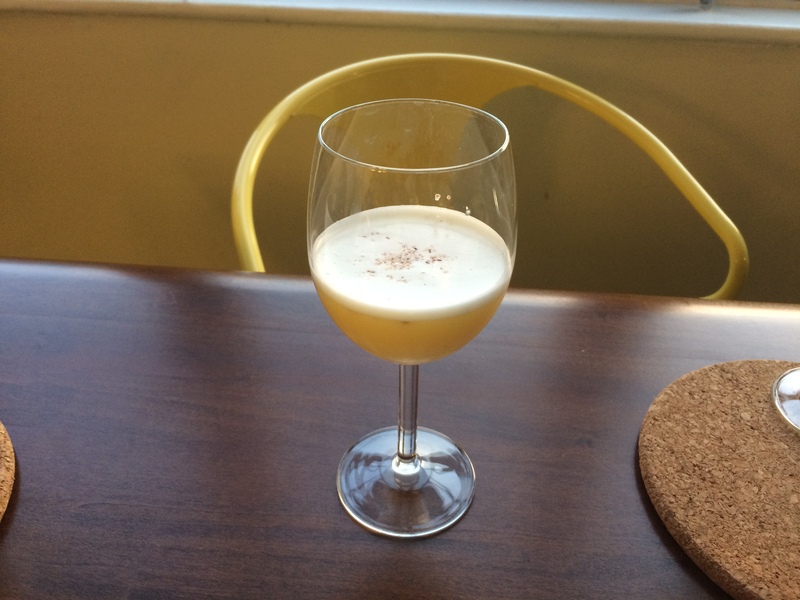 Weirdly good eggnog? Eggnog made by a sociopath? Egg wine? 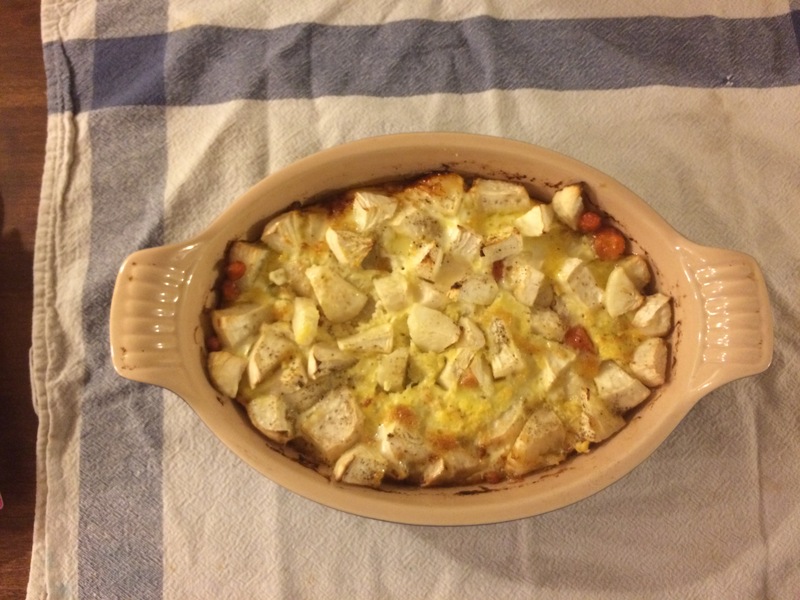 We unanimously preferred it with the addition of the “ale.” But I’m not sure if I’ll ever make this one again. All the same, I think “ramboose” is quickly becoming synonymous with “festive gathering” among my friends. Cheers! Here’s to a new year!